I used to do most of my photos on other sims than my own, but the hunt for locations got tedious and now I have been using mainly my own builds for several years. For this post, however, I ventured to the lovely Looking Glass sim where I found just the right sort of environment to show off the beautiful dress and jewellery by lassitude & ennui. Animesh has been on the grid for some months now, though only more widely adopted since it was added to the Firestorm Viewer more recently. A search through the Marketplace shows a growing selection of animesh objects. But the one I had been waiting for only came out yesterday, namely the first two horse breeds from the new Teeglepet range from Teegle. You may recall that I reviewed the Teegle Bento Horse Avatar when it came out over two years ago. I love the way it moves and the modelling of the different horse breeds, so I was very eager to try out the Teeglepet. As soon it was out on Friday, I hurried off to buy Maestro the Hanoverian and Sugar Cookie the American Paint Horse. To learn more, watch the video! Credits and some more discussion, including a brief comparison between the Bento Avatar and the Animesh Horse, at the end of this post. For credits and some more discussion, including a brief comparison between the Bento Avatar and the Animesh Horse, continue reading below. A lingerie shot for Valentine’s Day may be somewhat cliché, but I do think the addition of plaster elephant planters from Paper Moon makes up for this by being more unexpected. I also think the couch from Painfully Divine has a nifty twist to it: it has a really cute feature that allows you to change the writing at the front to either “spankings” or “smooches” and to adjust the tally from 0 to 10. The pose is not from the animations in the couch, however, as most of them are for couples and Ran was too tired to be dragged into Second Life today (we had a roadtrip yesterday and returned just after midnight, so he’s forgiven), so I ended up using a pose from a set by Serendipity. Both the couch and the pose are from the brand new round of Redeux. ContraptioN and Hotdog have a fanastic collaboration out at The Men’s Department, a set of fencing swords & poses as well as a set of fencing attire (not shown). This was definitely an excellent reason to do another video; even the poses are static it allowed me to show a much wider variety than I could in a couple of images. But of course I needed to take some cool shots as well, so you will find those after the video together with the full credits for all items worn and used. This post also features new outfits from the Dreaming Thicket and Stitched. Today is George R.R. Martin’s 70th birthday (happy birthday, George! 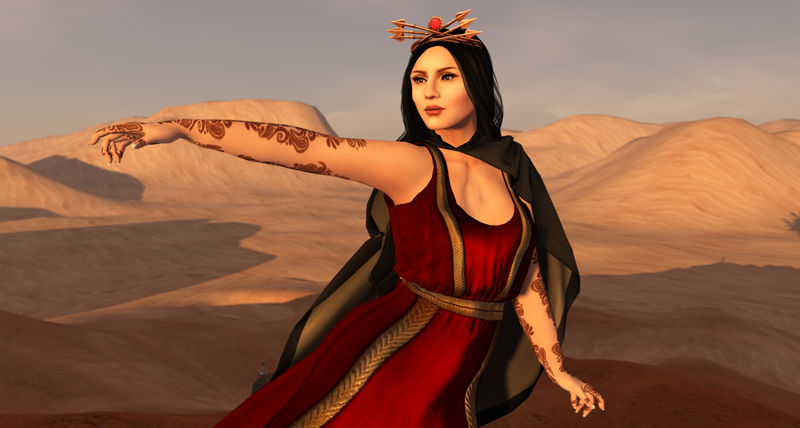 ), so it seems only right to be blogging Senzafine’s Elswyth gown which comes in 12 colour combinations inspired by Westerosi Houses. To show a bit of the variety available, I tried something I haven’t done in a while, namely to setup my avatar in three different looks and photo each separately. I had to be a little more careful than usual with lighting so that it work fine to splice the images together, so it is a bit flatter than I would like. But I think I need to play around with this more; it beats having to buy mesh body parts, skins, hair and clothing for multiple alts! I am in the middle of packing for another trip, but I couldn’t resist putting together a shot with the Zumurrud Draped Hammock from Roawenwood and the rate set of accessories from the Nyx gacha by Voluptas Virtualis. I love the little tropical scene that the hammock and the plants included in the set creates and the icing on the cake is the gorgeous ship by Rustica in the background. The landscape is from Landscapes Unlimited, one of the Solid Sky Landscapes. I had meant to write this blog before leaving for Spain, but I ended up only having time to post the images on Flickr. As such, this is just for archival completion and (partial) credits. Tropical Bodysuit by Luxuria (at TLC), hair by Magika and build by Zinnias (at Swank). The first Shadow Box from Death Row Designs was released today and I have done my first unboxing vlog in quite a while. As I am travelling early tomorrow, I will be a bit brief in my written commentary and share a bit of what is written about the Shadow Box on the DRD website, which I linked above and which you should visit to find out more about how the subscription works. After a brief absence, the Muses are back with four new gowns and it wasn’t easy for me to decide which one to pick up. 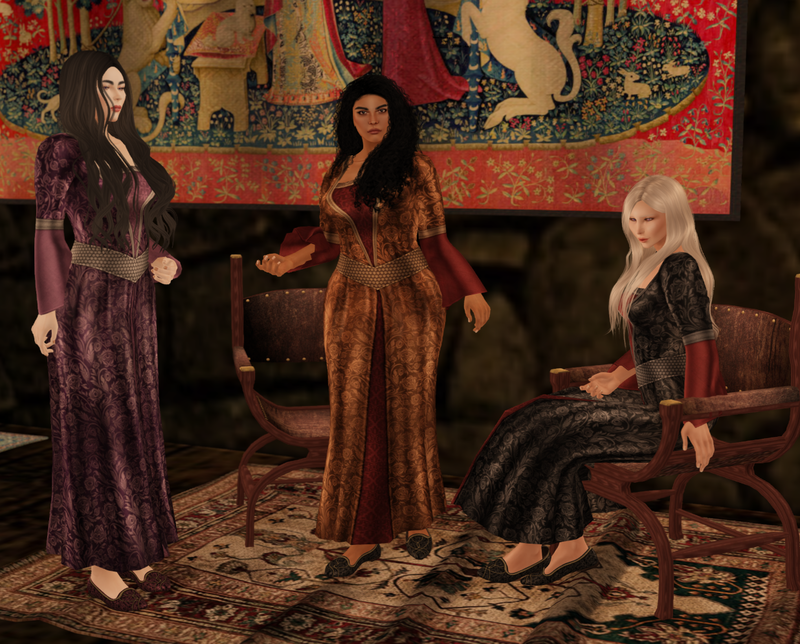 But I managed to make up my mind and the gown I did pick went beautifully with Aisling’s release for the upcoming round of Enchantment which opens later today. Also covered in this post are Fantasy Gacha Carnival pieces from Velvet Whip and SWaGGa as well as a new hair from Magika. ROMP is back with another round of elegant kink and I must say this is quite a spectacular edition with some very nice (and naughty) things on offer. Among those, new lingerie from Luxuria, a cosy rug and fireplace from Jian and some sultry eye makeups from Hekate. Also featured is a new mainstore release from Magika. Tuli is back with several new releases and as it happened they went beautifully together with the Fantasy Gacha Carnival gown from Fallen Gods and Faida and a hair from Magika that I had managed to forget about showing off after I bought it. Its still almost all about skins (and makeups) for me right now, though I did slip into a dress this time since the body is one I have featured in the past. This face from PXL is all new, however, and I paired it with some makeups from elymode, all from the Skin Fair which is now open. This round of Genre is inspired by South Asia so I thought a stop over at Skye Glas for my photos might suit well enough as a background for this dress from Luminary. I am also wearing a new hair from Magika and new shoes from Bushu. The latest release from the Plastik is the Malchia Corsets. I knew I had to have one of these once I saw the unique design and the gorgeous patterns and colours. However, that particular cut of a garment is difficult to work with if you’re not using a standard sized shape. But as the very lovely Aikea offered to upload an unrigged version for me, I took the plunge and picked up the striking Rogue version of the corset. As the whole corset is one mesh, I was able to resize different directions independently and this allowed me to work out a good fit. Of course, the trade off is losing the advantages of rigged garments, but sometimes it is necessary for us “shape non conformists” to make such compromises. ieQED has been producing a nice series of A Song of Ice and Fire/Game of Thrones inspired (but wholly original in design) crowns for various gatchas and for the Secret Affair the set included one called Sunspear. Being the big fan of Dorne that I am, I knew I wanted to feature it, so this look and these photos were largely built around the crown. The other item I really wanted to focus on was this brand-new henna designs from Chandra Masala’s Jalwa brand. It includes both arm and leg designs which you will see in more detail inside the post.